From a purely formal perspective, FC St. Pauli is a normal football club. Mostly at home in the second division, occasionally in the Bundesliga, sometimes in the third tier. That’s how it was up to the mid-1980s, too. Back then, the number of people coming to games ranged from the hundreds to a few thousand. This sedate environment offered unimagined space for something new. And this something new came from the local area. The St. Pauli district had witnessed a marked decline in the 70s, not least because of the economic crisis. The transformation of the quarter that set in at this time brought increasing numbers of artists, intellectuals and students to St. Pauli. Autonomists, anarchists and punks also began to exert a growing alternative leftwing influence on life in the district. In the spirit of this time, more and more people on the alternative left began to discover FC St. Pauli for themselves. The nonexistence of a fully differentiated support culture spawned a fan base shaped by alternative influences from the district that would go on to give the club its unique identity. The „new“ fans initiated a hitherto unobserved process – they brought politics into the stadium. With creativity, commitment, critical minds, spontaneity, self-deprecation and a strong political consciousness, a unique fan scene evolved that is not only loud in its support for the club but also in the campaign for solutions to problems affecting the district and against rightwing extremism, homophobia, and the increasing „eventisation“ of football, making the club what it is today. 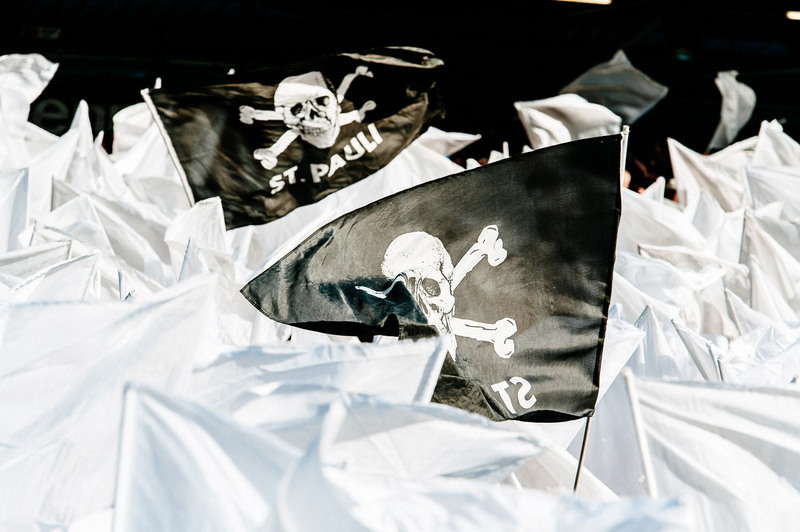 For St. Pauli is much more than a football club. It’s an attitude and a way of life, and it’s the biggest rock ’n‘ roll sports club in the world. Its teams take to the pitch to the sound of AC/DC’s Hells Bells; goals are celebrated with Song 2 by Blur. There’s no mascot. Instead, there’s the club’s trademark skull and crossbones. St. Pauli is also a magnet for culture and subculture. The club shops regularly host concerts and have become a permanent fixture of the Reeperbahn Festival. The Millerntor Gallery Art and Culture Festival recently transformed the Millerntor Stadium into an art exhibition and concert venue for the seventh time, and mobile shops selling skull and crossbones T-shirts and other merchandise have been a familiar sight at major festivals such as the Hurricane and the Wacken Open Air for many years. With Football and Love, a festival of football and culture, the club and its museum society have set new standards. In-stadium exhibitions and readings have also established the Millerntor as a place of culture in Hamburg. These are all examples why a club bereft of titles and triumphs has 19 million sympathisers in Germany and fans all over the world. Because that which makes FC St. Pauli what it is goes far beyond what is normally expected of a football club.